Fast Track Day Skipper Students pass their RYA Courses with Blue Oyster Sailing then go Mile Building! 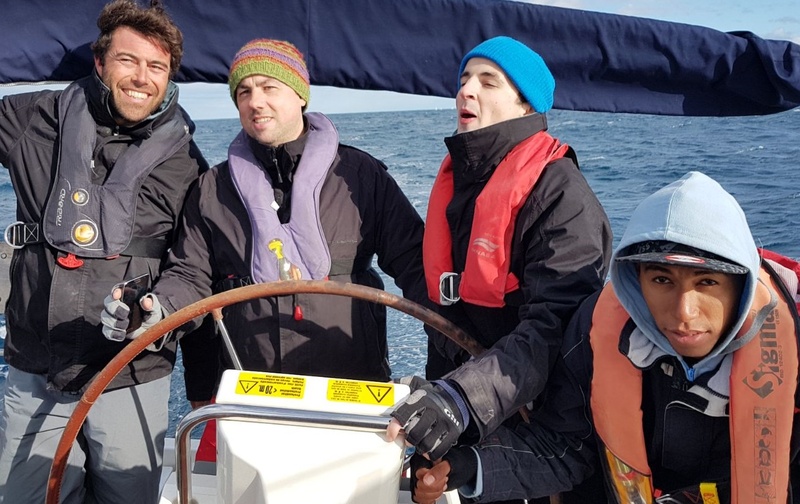 Well done to Kevin, Alexander, Kester, Benoit, Matilda and Joe who all successfully completed their RYA Day Skipper Training in January 2019 with BOS. 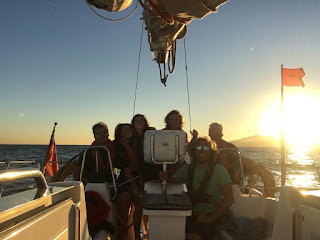 Kevin and Benoit then went mile building aboard SY Dogstar and are now passing through the Straits of Gibraltar en route to Portugal. The students aboard Joe, Benoit, Kevin, Eric, and Nona are all completing their 2500 offshore miles and qualifying passages for RYA Yachtmaster. Leg one completed with one stop in Marina Del Este. We offer Fast Track Courses for RYA Day Skippers Coastal Skippers and our 14/15/17 week courses for Power and Sail. Contact us here for full details. 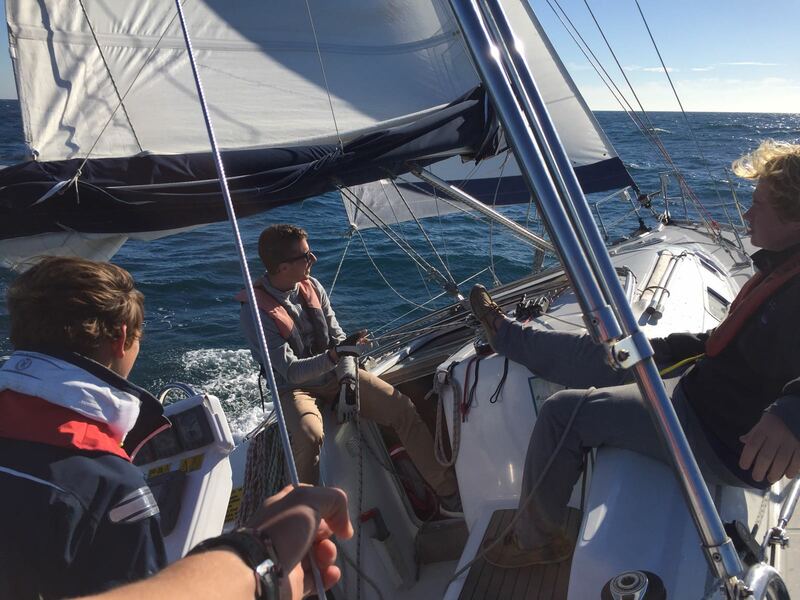 Blue Oyster Sailing Students now have the opportunity to charter our Jeanneau 45 Isavena Bareboat this year. Isavena is available to holders of RYA Day Skipper Licences and BOS offers its students a discount on her charter. 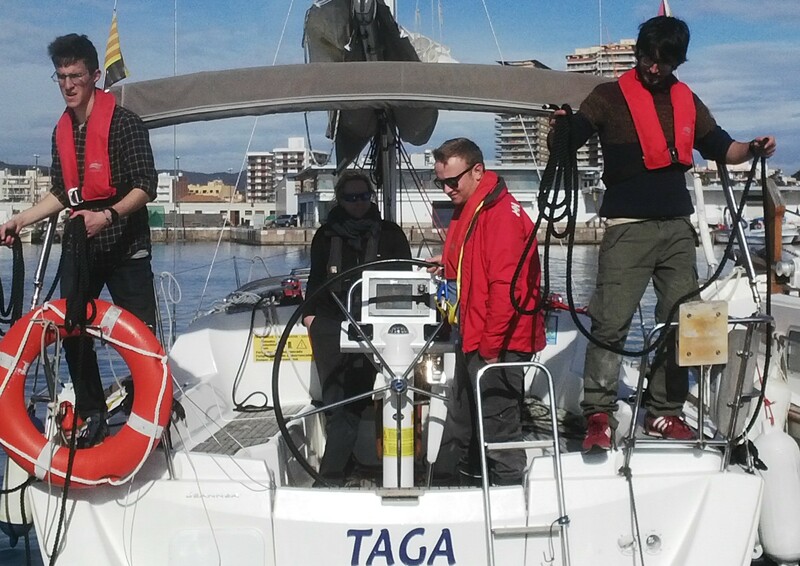 This year if you complete a course of training with us Isavena is available to charter from our Palamos Charter Base. 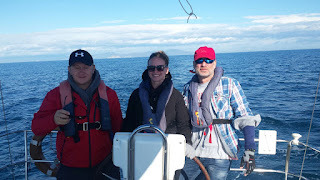 Fast Track Day Skipper Courses 9 or 14 days start every week and include RYA Competent Crew RYA Day Skipper Theory and RYA Day Skipper Practical. For qualifying nationals we'll help you apply for your ICC. Contact us here for further charter and RYA Course information. 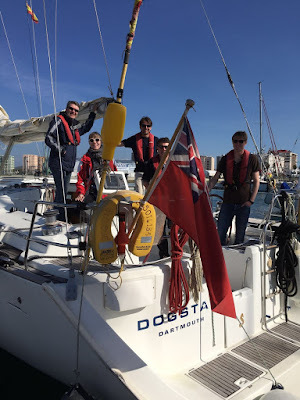 Blue Oyster Mile Building Yacht SY Dogstar MCA Coded based in Queensway Quay Gibraltar is available all year for Tidal Mile Building and Qualifying 60 Mile Passages with RYA Instructor aboard. 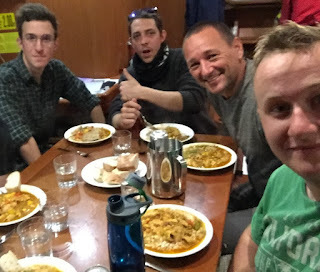 Jez, Shanyl, Hamish, Alex and Ina have all just completed a 3 week mile build which took in Cadiz (Spain) Lagos (Portugal) and Morocco amongst many other destinations including Ceuta and Mellile. During this time they completed RYA 60 mile qualifying passages sailed by day and night under continuous RYA Instructor supervision and managed to visit 15 different ports in the period. If you need Tidal miles for commercial use contact us here we sail every Monday all year. 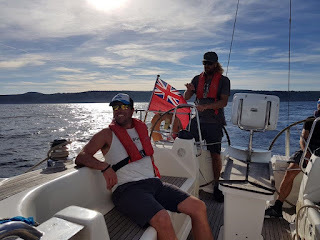 The tariff per 7 day week is £695 for 7 days sailing fully inclusive all meals aboard, fuel, moorings, own berth, bedding, safety gear and RYA Skipper. For further information email here. RYA Catamaran Training is available now from Blue Oyster Sailing. 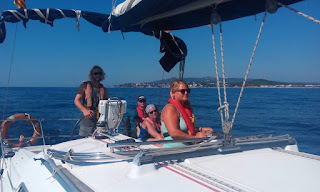 Our RYA Instructors are available to teach you all the differences between sailing a mono hull and getting the best out of your Catamaran Yachting Holiday this year. 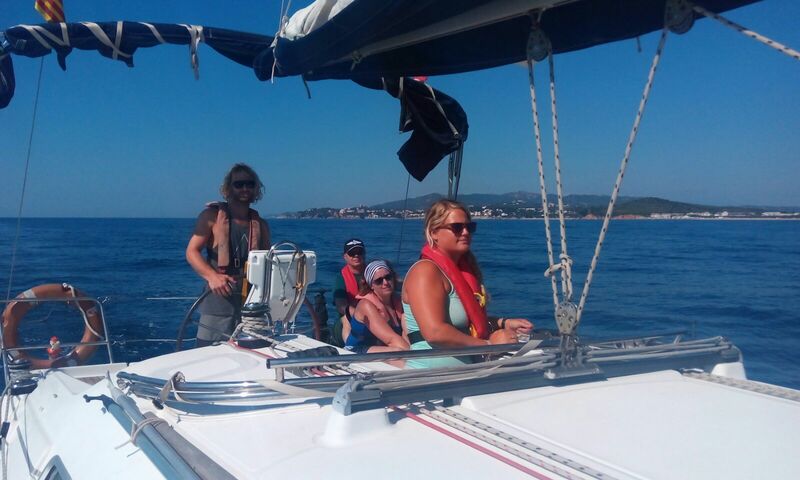 If you've already booked your Catamaran Holiday now is the time to book your Catamaran Training with our RYA Instructors. Our Catamaran is located near to Barcelona and can be easily reached from both Barcelona International and Girona Barcelona Airports. 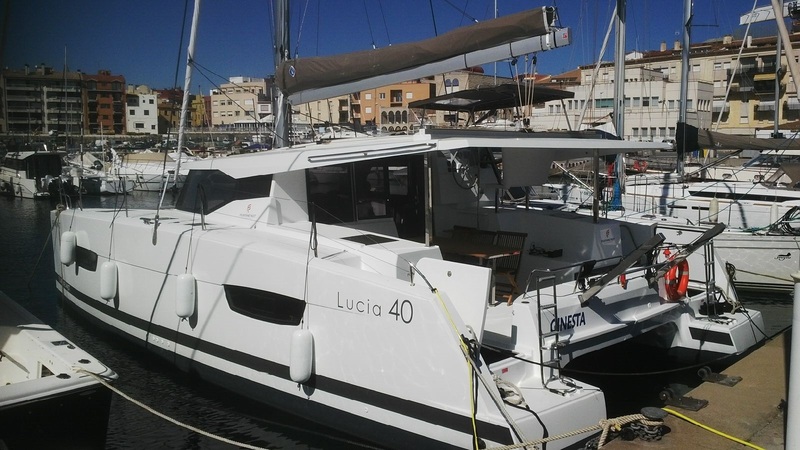 Ginesta is also available for bare boat and Skippered Charter just email here for details. 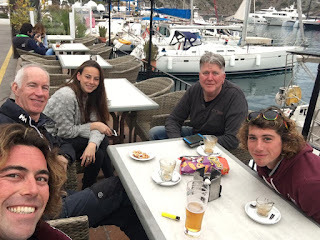 BOS reference from students sailing in The Bay Of Rosas Costa Brava Spain December 2017 - Happy Christmas All! 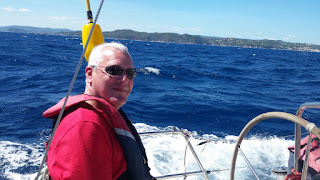 Congratulations to Henner who successfully completed his RYA Yachtmaster Offshore Sail and Power with BOS today. Now on my way back home from a very nice vacation. 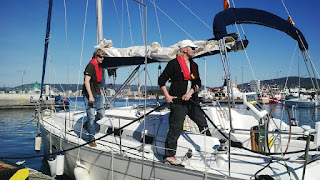 I joined Blue Oyster Day Skipper Practical and Theory in Gibraltar. My practical trainer a very skilled sailor and has excellent skills in teaching and passing on his knowledge. I learned a lot from him, so now I feel skilled and safe going on my own as captain on yacht. And as an extra bonus he knows the Gibraltar history and he is a very nice person to be with, great guy. We had a great crew and an amazing week that I will never forget. My best recommendation:) RYA Day Skipper Theory with Duncan Pell. He made me work hard every day never gave me a chance to slip away. Very qualified in teaching sailing theory. Made me feel secure in navigating and all other procedures related to being a captain. Interesting person to be with we had many great talks. Days I will never forget. Best Regards Hans H. Sørensen BOS RYA Day Skipper. Sorry we didn’t get a chance to say goodbye. Just wanted to thank you again for the course. Had a great time. Wishing you all the best… and some rest over the coming weeks. 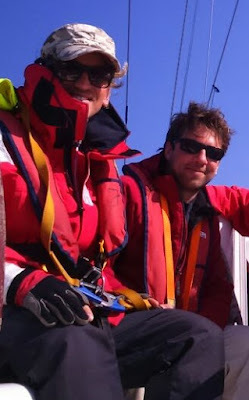 Jimmy and Alexander completed their RYA Yachtmaster Offshore Exams with BOS. Well done to Alex and to Jimmy who are both now commercially endorsed RYA Yachtmaster Offshore Skippers. If you need information about our RYA Fast Track Courses email here. 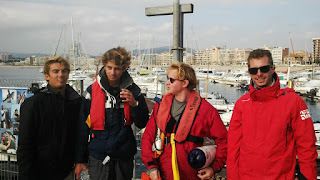 RYA Yachtmaster Fast Track Students Harvey and Ferran Pass their RYA/MCA Master Of Yachts 200gt Well Done! Congratulations to Harvey and Ferran both in photo far right who successfully completed their final RYA Yachtmaster Offshore Exams today. Well done from all the BOS Instructors - 15 weeks Training in Gibraltar and Barcelona have been well rewarded. 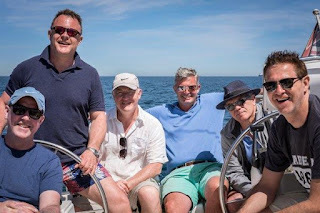 Harvey is heading back to work aboard his Super Yacht and Ferran to Barcelona and a new career in the Yachting Industry. Nate (left) crewed and his RYA Yachtmaster Coastal Assessment is next after a spell sailing with our BOS Gibraltar Team aboard Sailing Yacht Dogstar. Contact us here to join our Fast Track Yachtmaster Program and 'Train for Work' in 2017.
discussing the complexities of their RYA Yachtmaster Offshore Assessments......or are they? Good to see smiling faces after a day at sea and more importantly they really are studying. 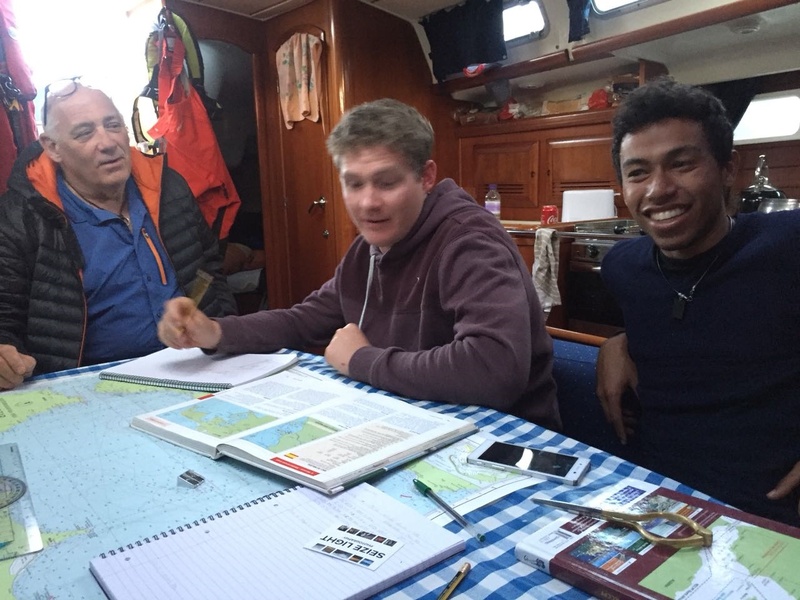 Today 9th February 2017 Harvey and Ferran (not in photo) are taking their final RYA Yachtmaster 200 gross ton assessments. Everyone else in the photo is offshore sailing tonight. 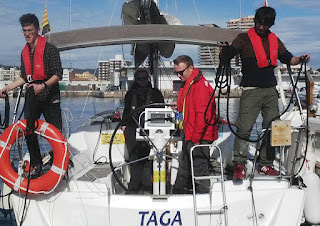 Join us in Barcelona and Gibraltar for professional RYA/MCA Yachtmaster Training qualifications that are recognised worldwide. Email here for further information. Blue Oyster Sailing Mile Builder from Gibraltar 20th February 2017 for 1 or 2 weeks. Sailing from Queensway Quay we'll be completing Skippered Passages and Tidal Mileage Training from our base in Queensway Quay Gibraltar. You will be sailing aboard our Beneteau Oceanis 473 large ocean going yacht fully equipped to RYA/MCA Specifications. 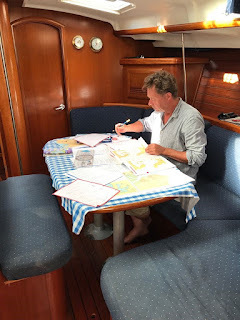 Your RYA Instructor Gerrit will be aboard and able to sign off all miles and passages. Sailing area weather permitting Gibraltar Morocco Portugal and Atlantic Coast of Spain. If you would like to join us from our Gibraltar base just email here or call +34 629 881 923 for additional information. I really enjoyed the Competent Crew course. Steve (RYA Instructor) was great, the experience and the comfort level I gained were incredibly rewarding. I'd like to come back to take the day skipper course. 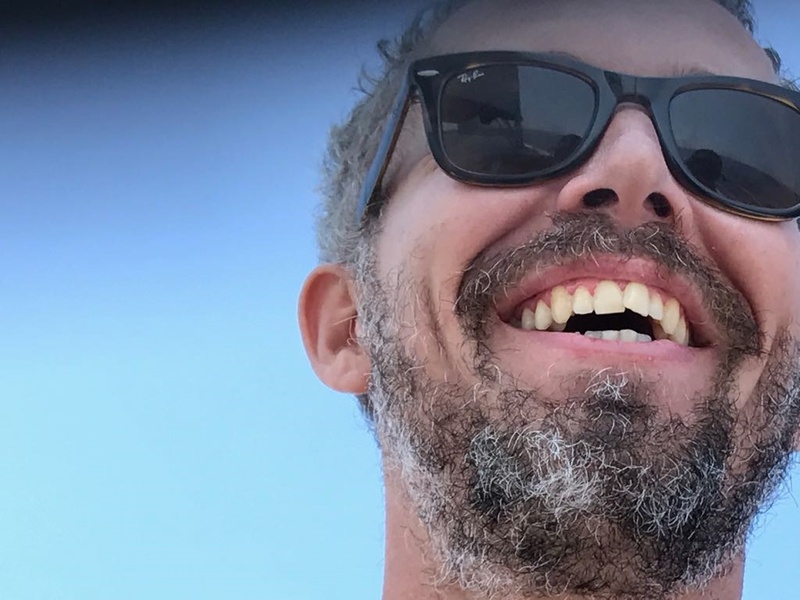 I'm not entirely sure when but I've been thinking about spending the month of my 35th birthday (March this coming year) traveling in Spain and would love to know what availability you have (at both locations-I might want to sail from Gibraltar if the weather is too cold in Barcelona Palamós because I'm a wimp) for that month. If the timing works I think it would be a great way to celebrate my birthday. If the timing doesn't work we'll find a time that does! 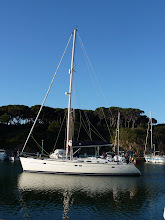 Hi Susie, Thanks a million for a great week in Palamos sailing SY Dogstar last week. Great boat, great instructor and great crew. Delighted to have passed the Day Skipper course. Best regards to all at Blue Oyster Sailing and hope to see you all again soon. (Photo is James Dempsey & Daria Isaeva). I would just like to give you some feedback on last weeks Day Skipper course that I attended. The boat was ideal for the number of people on it, well stocked with all the refreshments and food we needed. The sailing route we took was spectacular, giving us a great week of sailing. Moving on to our instruction. I would like to thank Steve for his seemingly never ending patience. His knowledge knows no bounds. I personally gained a huge amount of information and sailing experience day by day. I know this will make me a better sailor and enable me to get the most out of future sailing opportunities. Could you please forward this to Steve as I have no contact details for him and let him know that the Reeds Skipper Handbook has been ordered and will be fully utilised. Once again many thanks for a well organised course. I will happily recommend Blue Oyster Sailing. Hi Guys - Well done and thanks for getting on top of your Colregs. A very important part of the exam. The quality of your training was evident. Time to do your own thinking and decision making now. Good luck in your endeavours. I enjoyed being with you. 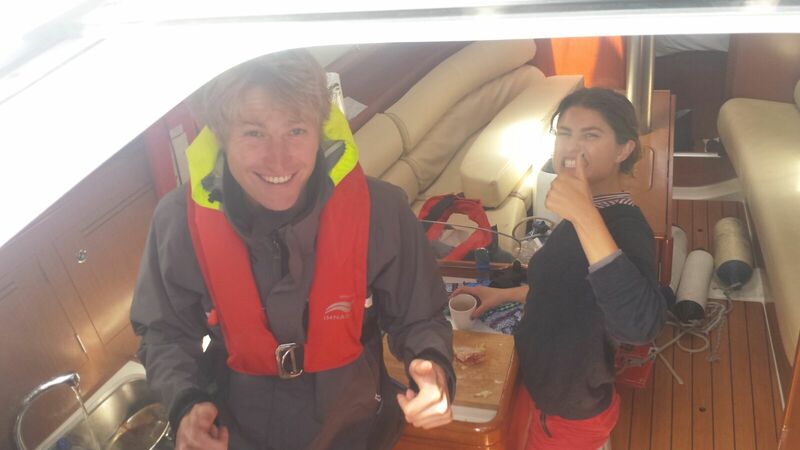 Will Stewart Passed his BOS RYA Fast Track Yachtmaster Course today and Ashley her Fast Track Day Skipper! 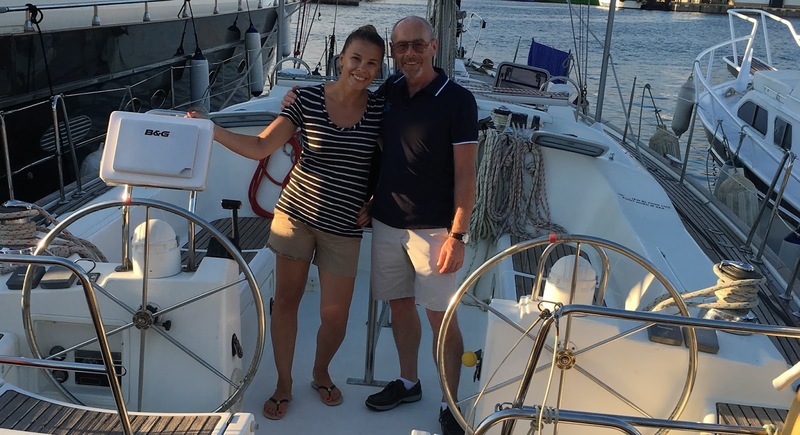 Will and Ashley celebrating aboard a BOS Training Yacht. Will Stewart successfully completed his 15 week BOS Fast Track Yachtmaster Course and is now off to work with Pavol in Croatia. 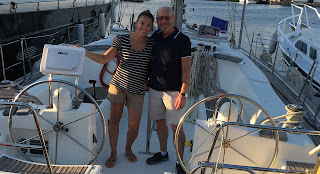 With Will is Ashley who completed her Fast Track BOS RYA Day Skipper Course. Well done to both of you! Ashley Reviews her BOS course. Susie, I am currently in beautiful Barcelona, but dreaming of being back on a student filled sail boat rocking the Costa Brava waters. I had a wonderful time and feel I learned so much in the Day Skipper course. Thank you for a great experience along with a great crew. 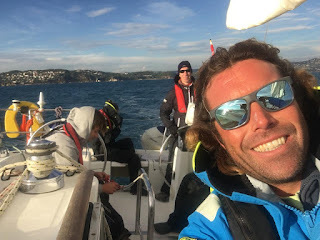 You were so clear and concise in your lessons, Mark is very knowledgable on sea breezes, not the drink... Charlie is awesome- great and relaxed, and Steve... Probably the coolest guy in Spain. I really enjoyed all of you. On top of a great school, I feel like I met some really cool people and hope to know them for a long time. 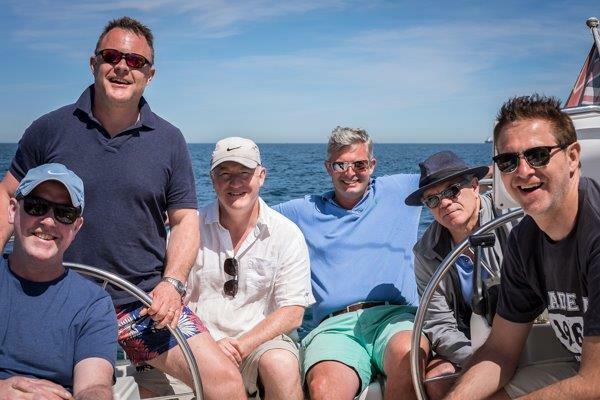 I came into Blue Oyster for an adventure on holiday, but now that I've finished my course; I'm itching to turn from my motor yachting career to a sailing one. Thanks for opening my eyes to this world. Now if you know anyone who wants a Day Skipper please open their eyes to me! P.S. Wonderful home cooked dinners... you are quite the chef. Congratulations to Will and Philippe who both successfully completed their RYA Yachtmaster Coastal Skipper Exams on May 7th 2016. Both are now completing the necessary paper work to endorse their licences for commercial use with BOS. Philippe is additionally completing his RYA Power Boat level 2 Course which he also intends to use commercially. Congratulations on a job well done from all the BOS Training Team. If you are looking for Commercially Endorsed Skippers for this season give BOS a call here +34 629 881 923 and we'll put you in touch. 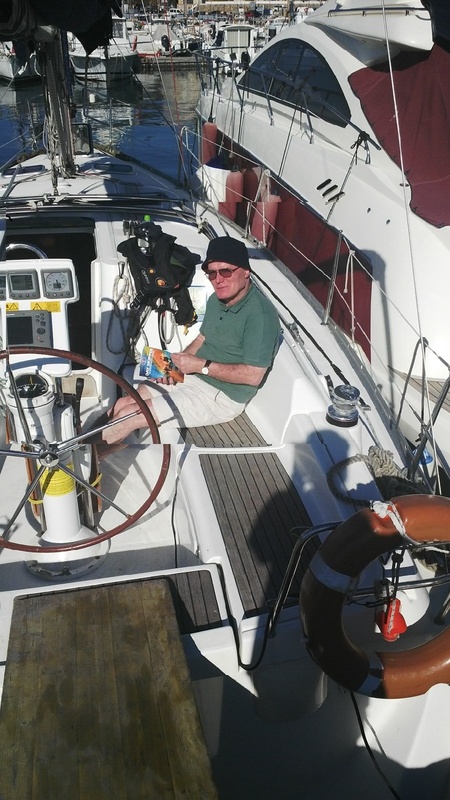 James Kendall returned to Blue Oyster aboard his new charge Talitha. Moored in Palamos bay to the north of Barcelona we organised our RYA Yachtmaster Ocean Examiner to complete his Ocean Oral Assessment. Congratulations to James and thank you for bringing this beautiful yacht to Palamos. See more of this story and photo's here. For further information +34 629 881 923 or Email Here. Pavol 'Lived The Dream' and Passed his RYA Yachtmaster Offshore Fast Track Course with BOS - Now to Work! It was a pleasure to do the BOS Fast Track Yachtmaster offshore with you and your excellent instructors (Charlie and Oliver). I want to say thank you for everything, I gained so much experience, I met fantastic people, made friends, sailed on various boats, seen places, lived a dream. I am ready for the next step in my life and take the new challenge. Just a note to thank you for the recent Combined Theory/Practical Day Skipper Course. This was perfect for me, as it enabled me to refresh the practical skills after some years break from sailing. Importantly, it filled in and updated many areas, such as navigation and safety, where my knowledge was lacking. The personal attention was excellent, and the mixing of practical and theory meant that good balance was maintained throughout the nine days. I particularly appreciated the fact that extra support was made available when I needed it - ie - navigation! The learning materials and workbooks were also really helpful. The most important result has been to give me the confidence to sail safely this year, and to build on the knowledge and skills I now possess. I would certainly hope to build on this by doing a Coastal Skipper course (hopefully in 2017): there is no question that I would want to do this with you! I appreciate, too, the offer of ongoing contact and support this year. I absolutely recommend Blue Oyster Sailing (Barcelona Sailing School) to anyone wishing to learn about sailing or to improve their skills. With thanks and very best wishes! 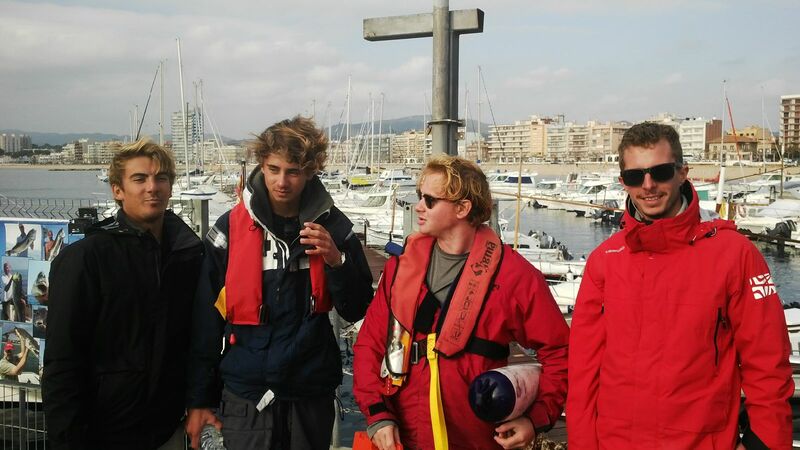 Pavol Stephen and Fedor all Passed their RYA Yachtmaster Offshore and RYA Yachtmaster Coastal Assessments! 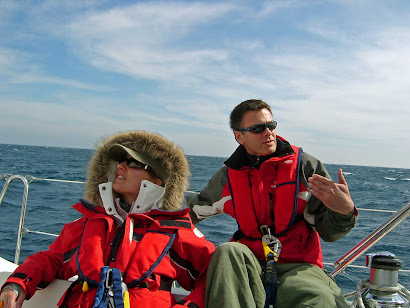 RYA Yachtmaster Coastal Skipper and RYA Yachtmaster Offshore Training with Blue Oyster Sailing in 2016. 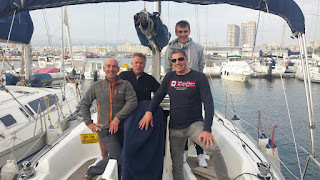 Pavol from Slovakia pictured right and Stephen from Australia both successfully completed their RYA Yachtmaster Coastal and RYA Yachtmaster Offshore Assessments along with Fedor from Russia with BOS last week. Well done from all the training team at both Gibraltar and Barcelona bases. Both Pavol and Stephen spent time at our Gibraltar base completing all of their tidal training aboard our Beneteau Oceanis 473 SY Dogstar. We have plenty of Mile Building and Tidal Training opportunities at our base in Queensway Quay Gibraltar and we also run a full program of RYA Training all year. SY Dogstar with Instructor Leonardo have just returned this weekend from a 600 mile passage between Gibraltar Melilla and Almeria. News on that passage will be published soon! Contact Blue Oyster here for further course information +34 629 881 923 or Email Here.